Visco-Gel® ToeBuddy® toe spacers gently realign and cushion your big and second toes for instant relief and all-day comfort. 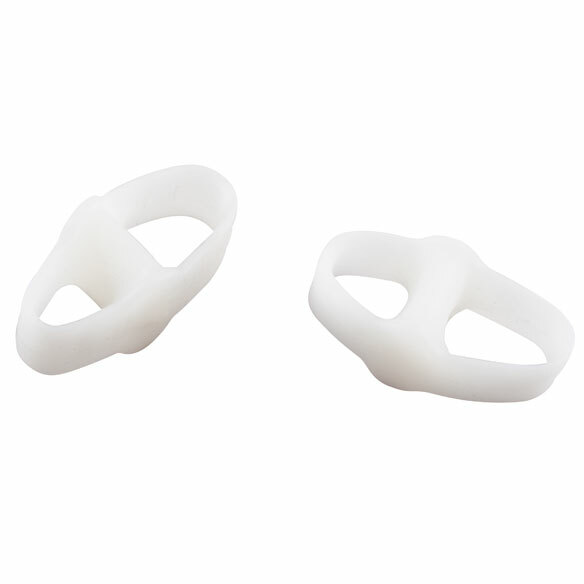 Soft, pliable silicone gel toe separator helps relieve pain, blisters and corns caused by crooked, overlapping toes. Designed to fit any style footwear. Was able to wear with comfort. Help my broken toe to stay straight and made it easy to sleep while wearing it because I wasn't get hung up in the sheet. These help keep my toes aligned. My second toe has started to curl over my big toe. This prosthesis keeps my second toe straight. i can't even feel the appliance when I am wearing it. With 2 in the package, one can be drying after cleaning in a mild soap whle wearing the other. I bought this product for someone in my family, and it works great. They feel comfortable wearing it. They also like the comfort it has when you wear it with shoes on or off. I say to get this product and try it out for yourself. Perfect product. This product works well but it will roll up on the big toe if your socks are tight. I have quite a few foot problems and these are extremely helpful. Align toes after surgical spacing errors. To separate those toes, I have used the Little Toe Buddys and they work great. Had surgery on big toe a few years ago. It is rising above toe next to it. I hope this will help relieve the pain! I've had these before and can't use anything else to keep my big toe from crossing over my other toe. Use in bed at night and helps me to sleep. Works well and doesn't take up very much space. I use this constantly between my toes. It releases pressure between toes and helps with possible infections. Woul recommend to people with problem toes. Because sometimes these two rubs together. They work! They're comfortable! Helped with balance. I hope this item will hold my toe in place. It was worth trying it. I hope it works for me to keep the second toe from overelapping. My wife used a similar product. Trying these out for the first time. A previous user and they do a great job. find these to be effect. Can sleep in and wear in shoes. I've looking in your catalog for sometime and decided to go ahead and order them because I was not able to find them anywhere else. I am reordering this product because it really helps for exercising with a hammer head toe. Previous bunion surgery space my toe too far, and I have spasms that appear to try to return to adducted position. help keep one toe from hiding under the one next to it. Used this item before. Very comfortable, easy to use and actually keeps toes separated. For my husbands hammer toes. my husband uses them for overlapping large toes, only thing that corrects his inherited problem. BEST ANSWER: Unfortunately these did not work for my husband, the gel was not comfortable and really stuck to his toes. Yes. They work very nicely. My big toe is small will this fit any size? Are do they come in different sizes. BEST ANSWER: Thank you for your question. We only have this one style in one size. We hope this information will be of help to you. how do I eliminate the Gel toe buddies from my cart ? BEST ANSWER: Thank you for your question. Click on the garbage can. We hope this information will be of help to you.